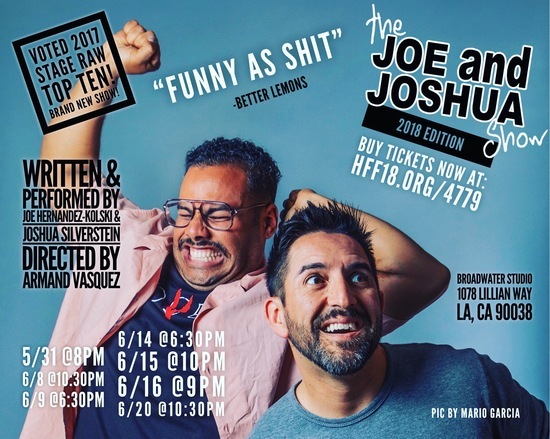 Josh & Joe are two extremely likable, relate-able, guys who have no problem digging out their darkest resentments and fears and serving them up for laughs. Both are moderately successful actors compared to most, just enough to keep them in the game but not enough to allay the inner belief that maybe they’re wasting their time. (IMHO, they’re not.) It is the cherry on top of the tales of their daily struggles with traffic, modern technology, self-sabotage, earning a living, dating, a first kiss that becomes retroactively surreal, parents, sexual equality, multi-ethnicity and being on-paper rich but empty-wallet broke. It’s all delivered in a funny, fast-paced, polished manner and they manage the hardest part with each bit; a satisfying pay-off. While the Studio is an intimate space and easy to fill I’d like to see Joshua and Joe playing to a packed house on the Broadwater Main Stage. They’re NOT doin’ it wrong!